So last week, I was playing with a new jazzy venture: a quintet known variously as The Men With No Name, 9 Hands, and 3 Mikes and 2 Fags (the latter caught on alarmingly well). Featuring my own brother Hugo Fagandini on drums, and the Michaels Powell, Cearns and Roberts on tenor sax, piano and bass respectively, it was something we’d wanted to do for a while in a slightly more official capacity, so when the opportunity came to play at Charlie Wright’s in Hoxton alongside More Ice and Honey and Amy Heasman, well, we jumped at the chance. We knew it was going to be a cracking evening the moment we walked in and were greeted by an alto saxophone at the bar, converted into an Asahi beer tap. Jazz and beer? Now we’re talking. After a little scurrying around to locate a hi-hat stand for the drum kit (thanks go to the kind staff at The George and Vulture down the road) and a brisk sound-check, we were ready to kick off the event. The talented Amy Heasman – who would later sing with us – opened the night, accompanied by piano and providing a delightfully warm set featuring tunes like Fever and Someone to Watch Over Me. Seriously, go check her stuff out on YouTube and things, she’s good. After Amy’s marvellous performance The Men With Some Names could consider the crowd pretty well warmed up for our own jazzy offerings. As well as a mix of original tunes (penned by Hugo, with more from other band members to come) and other numbers designed to lead the audience slightly off the beaten track of jazz – including Miles Davis’ Seven Steps to Heaven and the classic On A Slow Boat to China – we collaborated with three lovely singers: Amy, singing Can’t Help Lovin’ Dat Man, Lyubov Pronina who sang Peggy Lee’s Don’t Know Enough About You, and the talented organiser and promoter herself, Elena Dana, with the classic All Of Me – with a latin twist. Also, we occasionally turn into illustrations and have adventures. But it was More Ice and Honey, with their genre-defying (unless acoustic/jazz/folk/indie/awesome is a legitimate genre, which it may well be in this age of anti-folk and pseudo-metal post-modernist hip-hop) and unreasonably catchy music, that really tamed the crowd. The first half an hour or so entailed their vocalist Natalie and guitarist Ivan delighting onlookers with gypsy-jazz versions of standards, and when the full band took the stage, they took off with original numbers like Racecar and Forgive Me. It’s an unusual set up, with vocals, guitar, piano, alto sax, cello and percussion, but damn, do they ever make it work. 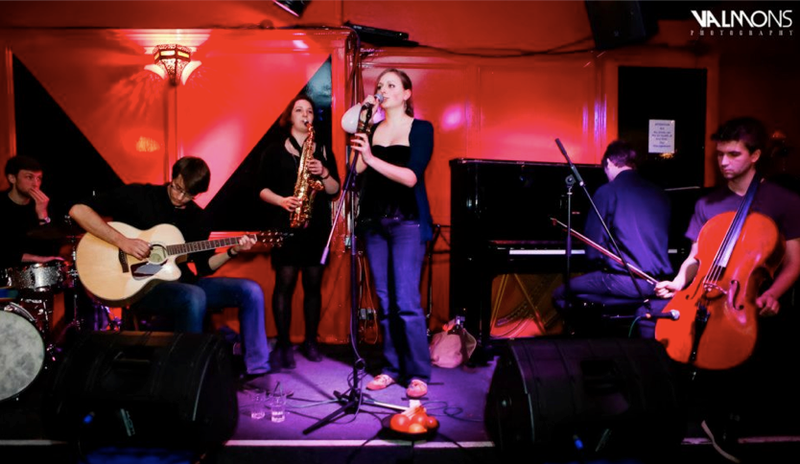 The Men With An Undisclosed Amount Of Names will be returning to Charlie Wright’s at the end of May, alongside a line-up of great singer-songwriters and UCL’s musical comedy troupe, The Wrong People. So come check all that out. You won’t be disappointed.